It is possible to get rid of many illnesses, eating daily a handful of nuts, the Spanish physicians confirm. Nuts are especially useful for people with “the metabolic syndrome” – the set of some disturbing factors such as overweight, hypertension and high level of cholesterol and sugar in blood. It is known that presence of a metabolic syndrome in patients doubles the risk of development of diseases of coronary arteries and diabetes. Representatives of Spanish University Rovira and Virgili have organized research with participation of 1200 volunteers with the metabolic syndrome. Scientists selected the Mediterranean diet as preventive therapy of possible diseases (style of a food involving the daily use of vegetables, fruit, fishes, products from integral grain and olive oil), enriched by nuts. Participants were divided into three groups. The third group received the mix of various nuts (300 grams daily). There were no restrictions in caloric content of a day diet . A year later researchers have registered the following results: 13,8 % of participants from the third group have got rid of a metabolic syndrome. The level of sugar and cholesterol decrease in blood was especially strong in the third group. 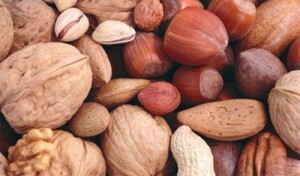 Nuts are the unique source of health, however, don’t forget that they possess high power value because of the big maintenance of fats. Don’t abuse the product, no matter how useful it might be.